There has been much discussion lately about fakes and other NOS lanterns that show up from time to time. The new collector is foaming at the bit, trying to decide whether to pull the trigger on that shiny new-old-stock Gold Bond 200A that just popped up on Ebay with a “low” buy it now price. He knows that it should be more than that but he had better act quick or it will get nabbed out from under him. There he sits giggling when he gets it. It was the most he has ever paid for a lantern, but gee whiz; it’s a Gold Bond! It is worth it and he could sell it for more if he needed to. Panic sets in when he sports his new acquisition online and its authenticity is questioned. Did he just make a large and expensive mistake? With the availability of reproduction parts, decals, replating and reporcelainizing, making fakes has become easy. Fakes have a market because many buyers simply don’t know what’s real and what’s a farce as nobody has educated them yet. They don’t know where to look or who to ask for details. We as collectors are passionate about it so that the history of the product line doesn’t get muddy or de-value what we have in our collections. We will never be able to stop people from making counterfeit products, the best we can do is learn what is real and recognize the features to look for to stay safe. Gold Bond only came out in 200As, 228Fs, 228Hs and the 425E, 413G stoves. They never made coolers, heaters or any other model lanterns or stoves in the Gold Bond scheme. The 200A came out in 11/71, 5/72 and 2/73. The 228F came out in 1/72, 6/72. The 228H came out in 5/73, 12/73, 2/74. The 413G came out in 4/72, 10/73, 2/74. The 425E came out in 5/72 and 2/73. They all came in a plain box, no pictures with black printing. Get familiar with the mustard yellow color if you intend to search for one of these. Many fakes don’t even come close to the real Gold Bond color. The earliest X-mas lanterns that I’ve found is the model 200 from 1/51. These have brass painted founts with nickel plated brass base rests. The 200A debuted also in 4/51 with a painted steel fount and a steel base rest that has been protected with a matte clear, anti-corrosive finish. The fount has a large stamping on the side of the fount. There is no decal on the fount. Decals debuted in 9/51 with a plain red logo without a border. It is located on the bottom edge of the fount, right above the lip. These continued until 12/51. 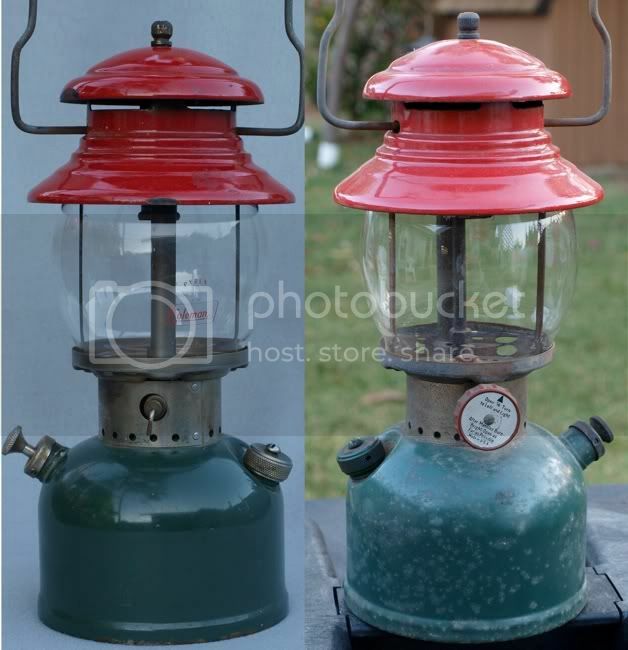 I have seen some examples of X-Mas lanterns from 12/51 with a black band or a black burner frame which are probably one of the last to be made. The burner frames are the earlier type in which the ears of the bail sockets do not engage the ventilator and the bottom is perforated. Since the ventilators didn’t engage the ears of the bail sockets, the holes are smaller where the bail pokes through. The porcelain coating is not really a solid color, rather it is finely speckled. The black bands are prevalent from 2/52 to 4/53. They have a steel base rest painted black along with the burner frame. The burner frame is still the short ear version as found in the X-mas lanterns but the later versions deleted the perforations in the base plate. The burner frame is painted except for the air tube. They have a red decal with a yellow border located at the bottom rim of the fount. The fount has a large stamping on the opposite side. The vents are the same as the X-mas lanterns with the small holes and the speckled finish. The black bands stopped in 5/53 in which the burner frame and base rest (still steel) have a matte clear anti-corrosive finish. The fount is the same as the black bands with the fount stamp and decal. Burgundy. Would you like some cheese with it? The burgundys came out in 9/61 and ended mid 1962. The end date is difficult as the color change back to red was gradual and was fully completed by 8/62. You can tell the difference in color using the decal as a reference for the original red color. They are typically not faked as they are plentiful. A word about dates. The dates mentioned above in the X-mas, Black Band and Burgundy lanterns are the most prevalent dates fount. The cutoff has been defined when lanterns with different features are found in abundance either before or after the dates mentioned. It has been discussed that examples have been found ±3ish months outside of these dates but these examples are very limited. These founts or base plates may have been leftovers or may have just sat in the bottom of the supply barrel until they were finally painted or used. This cannot be easily determined but they exist nonetheless. If you come across one of these outliers, give it special attention and inspect much closer. This does not apply to the Gold Bond series. Again, this does not apply to the Gold Bond series. These are the most difficult to spot. These could be any lamp, lantern, stove or item. What you have to look for is more difficult as you are looking to recognize finishes, materials, packaging and other characteristics that the products had when the left the factory. You have to know what box style, what paperwork, what accessories typically came with the product you’re looking at. Polish and buff – be wary of anything polished or buffed to a brilliant shine. The only thing that ever came from the factory with a brilliant shine is anything that was nickel plated such as founts and base rests. Burners, valves, burner caps, etc. never had anything but a mill or cast finish. Painted founts had a utility paint job. They were not buffed out. Steel parts had a protective finish such as galvanizing or cadmium plating. Also, even if a lantern has been sitting in a box for 30+ years, you will see scuffs on the lower lip of the fount and possibly on the sides where the side of the box has come in contact with the painted surface. Buffing is also used to remove burn marks. If it says it's never been lit, look closely for signs of cleaning and buffing to remove these heat signatures. Painting - Much of the same issues with polishing and buffing apply here. If the paint looks too good, look closer. The bottom lip should have scuffing from sitting in the box, no matter what. Some series of early painted lanterns have the same drip on the bottom side of the fount from the original painting. Get to know the colors and what standard rattle can colors are out there. Krylon forest green is close but a little bluer than the original. Burner frames are another item often painted to hide rust. The early frames were painted but the paint was very thin. I've never been able to reproduce it and have it survive the heat. Decals – water slide only on everything. You shouldn’t be able to see an edge on the decal like you would with a vinyl sticker. The style of decal is harder as you have to study other lanterns from the same era to learn what the decals look like. I have yet to see a reproduction decal that matches the very early 1950s lettering. They seem to have a taller aspect ratio than the later ones. Decals are crisp, not hazy like the edges from a inkjet. 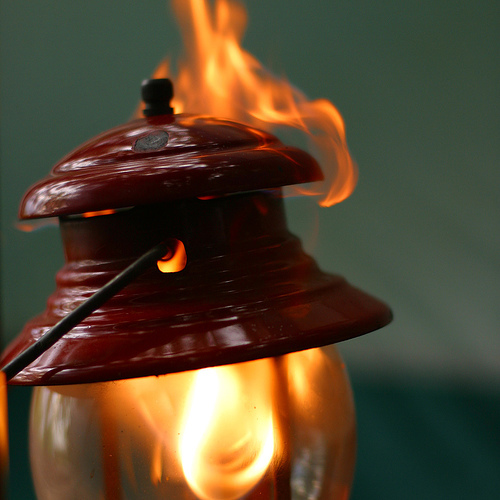 Boxes – If a lamp or lantern looks pristine and the box looks like it’s had better days, wouldn’t you think the lamp or lantern obtain damage in the same areas as the box shows? Does the box show signs of being “soft” from being stored in a high humidity environment? The lamp or lantern should share the same effects as well as the paperwork in the box. Does this mean that all sellers who paint/polish/clean/buff/reporcelain/restore are evil? Not at all – as long as they divulge that they have done so. Custom paint jobs, bright plating, newly plated vents are great and keep you from getting bored with the same old thing. So go ahead and buy away! If that fake Gold Bond speaks to you, be sure you are willing to pay for what you are getting – and you may be stuck with it. My goal is to not create controversy, but to prevent it. If one person is prevented from making a several hundred dollar mistake, the mission is accomplished. Dan, I've got a 1/51 xmas 200 model that I forgot about in my original post this morning. I hope people understand your angle here -I sure do! I'd like to see some pics on the 1/51 painted 200 to help educate me and everyone else. That would be the earliest known. Flash also showed me pics of a Gold Bond 425 stove. If there are errors/additions to the dissertation, please add them or PM me with details and pics and I'll edit the text. I'm learning as I go too. This is good stuff Dan. Thank you for taking the time to post it up. Appreciate it. Should be required reading. Great information, Dan. Thank you. This is the first time I have seen this info in a condensed form. I never knew there were just certain months for the GB lanterns. I always thought there was a continuous run of them for a few months in succession. Now, where's my b-day 228F at...I need to get painting....just kidding, would never do that. These fakers on eScam already pi$$ me off enough with that stuff!!! Looking for 8/78 & 3/05 b-day lanterns. 1/51 on the left, 4/51 on the right. It came up in a comparison here more than two years ago, unfortunately, nothing lasts that long if it is in Just Bull. Nickel fuel cap, nickel plated brass collar, brass painted fount, red valve knob, frame with multi-perf'd floor, vent with small oval bail cutouts...rusty fount base, but definitely stamped 1/51. There doesn't seem to be any nickel beneath the paint, just brass. The paint appears to be pretty old. I got it on eBay two years ago from a seller who has a very eclectic range of items sold, a few Coleman items, but more like a picker and probably not the sort who would take any time to make a fake Coleman lantern. Excellent write up Dan. I would only add one thing to it. With the Christmas lanterns, burgandies, and black bands, they would fall into the date range you mention. So if the lantern had been painted at least you would know it did start out original. Not so with the gold bonds. Coleman was making red 200A's with the exact same dates so no guarantee that it started out original. If a gold bond has been painted then I would assume right off the bat that it is a fake, regardless of the date. Great Post Dan. If i might add...There have been a few 8-61 burgundys that appeared in the past also that appear to be original. But very few! Thanks for doin this thread Dan. With so many fakes people are doin its nice to really be able to narrow these dates down on these. Makes me laugh cause i just seen a 200BB someone on ebay is selling. Funny thing is they say its a 1959 which clearly isnt a BB. Cant wait till everyone chimes in so i can print this off to keep for future info. Thanks again. There's another subtle difference to Goldbond boxes but should that be left a mystery to keep the hoaxsters at a loss? Or do I get an "A" for being a pessimist about human nature and money? Thanks for the pics, I've updated the dissertation. Is your 4/51 a 200 or 200A and is it a steel or brass fount? The pics look like steel corrosion, but I want to confirm. That makes nickle 200's only made from late 12/50 to 1/51? The only nickle 200s I've seen are from these dates. I agree with the repainting of Gold Bonds but I would have to look at the vent pretty close. Original vents can be spotted pretty easy as they typically have minor damage to them, typical of years of storage and service. Slight rust around the edges of the holes and spot welded parts typical. The box will slightly haze the edge of the ventilator after years of storage. Soot evidence also. I'd like to see an original vent next to an IPE vent and inspect the differences. As far as faking the red ones, it can be done but as mentioned, they would have to re-plate the vent and I'd figure that finding a red 11/71 fount is just has hard as finding a 11/71 Gold Bond. If you find a pic of an 8/61, let me know. I've seen several red ones from August and placed the starting point at Sept as I've seen examples of such. This tightens the focus more. I'm all ears on the box details. Were the plain Goldbond boxes not marked with the same model numbers as the 200 and 228 but with an "A" at the end? So a proper Goldbond 228F would have a box marked 228F195A? Is your 4/51 a 200 or 200A and is it a steel or brass fount? The pics look like steel corrosion, but I want to confirm. That makes nickle 200's only made from late 12/50 to 1/51? The only nickle 200s I've seen are from these dates. The 4/51 is a brass fount model 200. 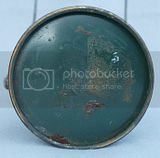 I have been collecting model dates on ebay for a while now and have only gotten serious in the last month or so, requiring a clear readable photo of the base of the lantern before I will confirm the date. I saw what was listed as an 11/51 200 nickel a while back, but it must have either been a claim by the seller with no base photo, or it was before I began noting the confirmation of the date. Somehow, I think it was a real 11/51, but that's only my recollection. (I hope it wasn't Canadian, I'm usually careful to note the difference.) Otherwise, I only see 12/50 and 1/51 on the 200 nickel model. Gold bonds boxes were marked with a 702 at the end to denote the color. So a 200A would be a 200A702, a 220F would be a 220F702 and so on. Whoopseedoodle as Ned Flanders would say. I think I get an "F" instead of an "A". Knew there was some diff for the colour--I wonder where I got "A" from as the goldbond designation? I'm getting a lot of PMs about items found that are outside of the dates listed. An example is a 6/61 burgundy. Clearly from looking at a lot of examples, red was prevalent on the 200As in the summer of '61. Then we have these oddballs as this lantern is clearly not red. Another is the transition around the end of '51 from the two tone X-mas to the red/black band model. X-mas lanterns are found with black bands and burner frames in this time frame. I don't think they are fakes as they are falling into the correct time frame and it just shows that stocks are being used up before the other has been depleted. Hypothesizing here, the base plates were stamped out with the date stamp and go into a large bin to be used in the creation of founts. Could it be that newer plates could be dumped on top of the older ones until they are all used up at the end of the production run? That would give us our crossovers and such at the transition times. Comments? Clearly, we can approximate the time changes ± 3months. Basically we shouldn't get hung up too much on dates unless they are way outside of the agreed upon calendars. Thoughts? That base plate idea sounds plausible. Another base plate hypothesis has occurred to me, relevant or not, here it is: Some have been stamped with the year, but the month is often with a different style stamp and sometimes in a rather haphazard way, not in line with the year. (I'm thinking 1950's, early '60's 220/228's on this.) I would guess that the year was stamped on a batch of bases, then the month added later as they were being used. Thanks Dan, very helpful to a new collector. Always on the lookout for one of those less common finds and I'll reference this if I get the chance. I bought a yellow cat heater this summer because I thought it might be in the Gold Bond line. Glad I only paid $3 for it. If anyone wants it, there's a lovely '65 xmas on the bay. At last he isn't totally trying to misrepresent it. It's listed as "xmas style". I don't know what's more criminal, the fakes our the prices of the rest of his stuff ? Looking for (Cdn where possible): 3-2006, 11-2007, 11-73 (Something nickel) 5-79 ( Something pretty for my wife ), 2-47, 10-48. "Gold Bond only came out in 200As, 228Fs, 228Hs and the 425E, 413G stoves." Did you mean 220F instead of 228F? Dan, Thanks for a GREAT write-up. Hopefully we all learn a little more about the things we enjoy. Thanks for the wrote up!! Not ready to buy any of these at this time, but I will come back to this thread before I make any purchases. Posted just to make sure I find it at a later date...but a sticky would be great! There's a "goldbond" color heater at a local junk shop around here with the correct date (1-72) for a goldbond. Did Coleman just make some yellow for their own line since they were running stuff for Goldbond trading co.? I might buy it anyway as factory gold is factory gold and it's 8 bucks! It's plausible, but it's not a Gold Bond. If the yellow color speaks to you, go get it. A turd is something you flush. Thank you very much for the information, Dan; VERY helpful! Thanks Dan for starting this thread. It's probably the best thread I've seen on here in some time. Very good authentic information that can be archived so we can refer to it at a later date. I was wondering why no one had challenged what was going on. The best way to combat this trend is to put out the facts. Again, great thread. Edit to add Daniel Niederhofer's 5/72 425E stove. The tank is stamped 8/72 on the mounting tab.